Children's Kindle eBooks, early learning educational kids books. Bedtime stories. Writing and illustrating children's books that help kids learn, relate and understand the world around them through basic learning fundamentals. Book topics include the alphabet, shapes, colors, numbers, animals, first words and a variety of educational stories and nursery rhymes. The colorful illustrations, simple text and adorable characters make our books exciting, interesting and easy to follow. Discover a fun new world of early learning. Allow your child to explore, learn and develop. Join the VIP list to be notified of any free book offers, discounts, book releases & promotions. 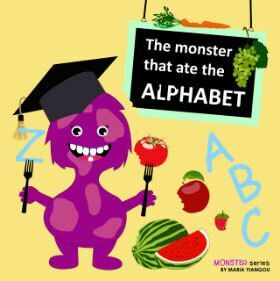 This book introduces and teaches children the ABC’s in both upper and lower case letters. Each letter of the alphabet is a fun character performing an action that represents its letter. It also teaches children words and phrases that start with each letter of the alphabet. Learn 2 dimensional and 3 dimensional shapes through fun shape characters. See examples of everyday objects that reflect the shapes. Introduce your children to the alphabet and basic words. Words starting from A to Z are represented through fun and colorful illustrations. Learn numbers from 1 to 20. Bonus pages dedicated to counting by 1’s, 2’s, 5’s, 10’s and 100’s. A beautifully illustrated book about colors. Single color depicted on each page along with matching illustrations to show examples of the color. Learn the primary colors and also how to mix colors to create others. Learn the alphabet along with animals that start with each letter. Animals include elephant, tiger, cat, duck, penguin, kangaroo, giraffe, fish, toucan, whale, lion and much more. Beautifully illustrated animals and interesting simple facts about each of the animals can be viewed on each page. Learning the alphabet couldn’t be more exciting! Discover familiar and exotic fruit and vegetables while learning the alphabet. 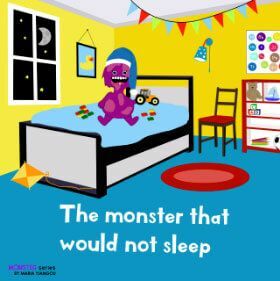 This book is filled with fun rhymes, colorful illustrations and of course the adorable purple monster! A beautifully illustrated rhyming bedtime story book about a little monster that doesn’t want to go to sleep. He tries in every way to avoid going to bed however his mother doesn’t give up. This book teaches the importance of sleep in a fun and encouraging way. A beautifully illustrated rhyming story book. 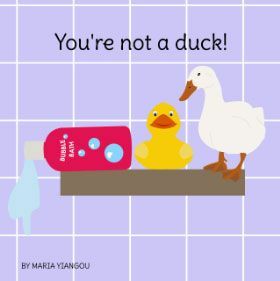 This book teaches children that being different is okay and everyone is special in their own way. It shows the importance of being self confident as well as being kind to others. The story ends with a wonderful friendship. 100 pages of educational fun for children. 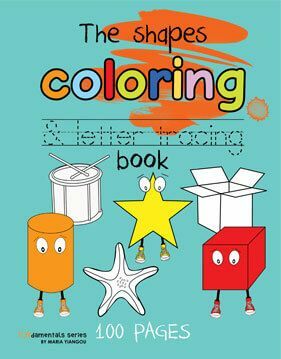 This activity workbook is filled with large coloring images as well as letter and shape image tracing activities. Learn 2 dimensional and 3 dimensional shapes through fun shape characters. Color examples of everyday objects that reflect the shapes. 80 pages of educational fun for children. 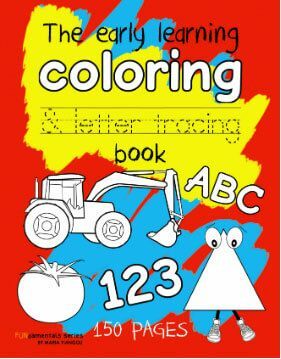 This activity workbook is filled with large coloring images as well as letter tracing activities. Learn different means of transportation & vehicles by coloring images and tracing their names. 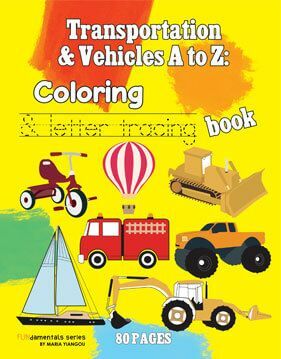 Color all types of transportation & vehicles beginning with every letter of the alphabet. 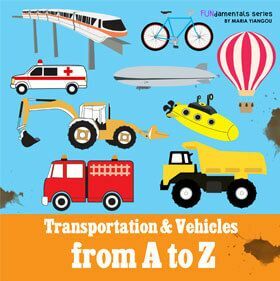 Learn different means of transportation and vehicles that start with all the letters of the alphabet. Each page is dedicated to a letter of the alphabet and colorful images depicting various examples of transportation and vehicles. 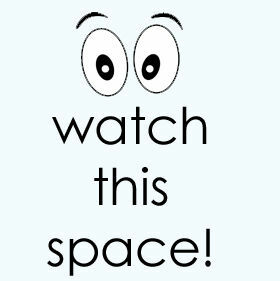 Stay tuned for a new exciting book. We offer a wide variety of children's educational Kindle ebooks. The early learning educational kids books for infants and toddlers cover topics such as the alphabet, ABC, shapes, animals, colors, numbers, counting and much more. Fun and colorful story books that include bedtime stories, nursery rhymes, growing up and facts of life.